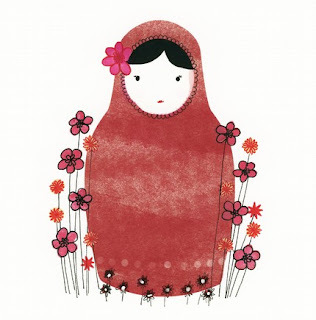 sfgirlbybay: Babushkas Are The New Black. Babushkas Are The New Black. Well, actually I think maybe Babushkas are the new deer or the new birds, but you get my meaning. Woodland creatures could be on their way out. Wooden dolls, in! Babushka this, babushka that. I'm seeing these these traditional Russian nesting dolls everywhere! Even fashion mavens are learning to tie their very own babushka! I think it might be someones idea of peasant-chic and a modern take on the 'get back to handmade' that has become so popular. 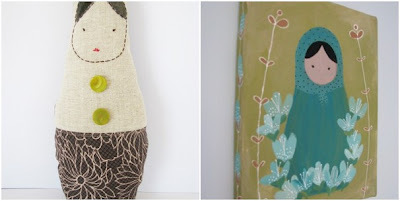 (above right) and Ines Painting from etsy shop tsktsk. 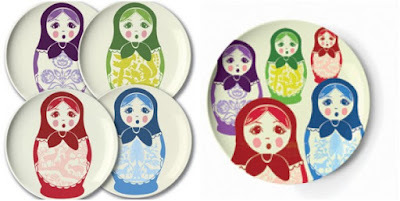 Some fun and funky Melamine dishes and dessert plates from Fred Flare. 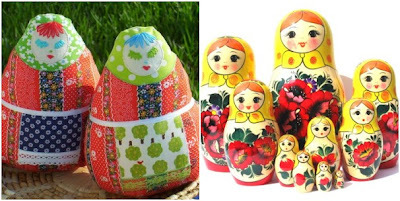 a pretty set of the original Matryoshka wooden nesting dolls. 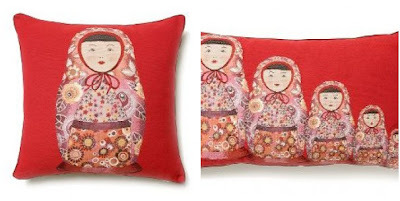 Anthropologie's beautiful Babushka throw pillows in Russian red. 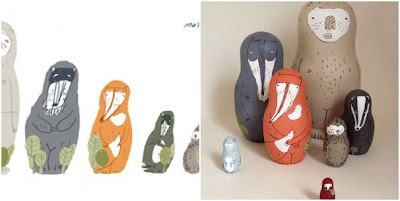 Irina Troitskaya and her twist on the dolls come to life. last Fall, so they were definitely ahead of the curve (as per Paola below!). Interestingly French design trio Atelier LZC introduced these last Fall, so they were definitely ahead of the curve. I love the throw pillows in particular. thanks for all the other great links, guys. i clearly shoul dhave stayed up later last night doing my research!! Oh that made me laugh today! Babushkas! Just saying it makes me laugh! Love them! 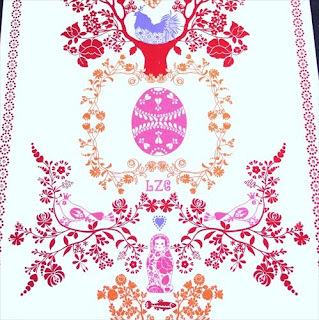 (and here comes some more shameless self promotion) I actually made a holiday card a few years ago with Matryoshka's. I have to get that tsktsk painting! I had the nesting dolls growing up and loved them. Then I used the bottom half of one for a tea party cup for my dolls and it warped and cracked. I still haven't gotten over it. I love those Babushkas! Love 'em all! After Tiel of Tsk Tsk bought one of my Matrioshka doll baby tshirts, she sent me three blank dolls. I don't know if I'll ever have the courage to paint them though! You hit the target dead center with this post! They were all over the Chicago Renegade Craft Fair. Also popular, multi-legged sea beasts (squid, octopi). But yeah, the dolls won. Woo hoo! 14 hours of college Russian finally comes in handy! You will never guess where I found a Matryoshka! At Ikea! I will take pics and will send you the link to my flickr page. I thought that woodland-creatures and deers were the new Matryoshkas :-) At least, that's how it feels here in northern Europe.